Seats in a live or movie theater are used by hundreds (if not thousands) of people every month. Made primarily of foam covered in fabric, they suffer wear and tear over time. They are also sometimes the victims of deliberate vandalism. If a seat in your theater has cuts, holes or other damage that needs to be repaired, the task can be accomplished without too much effort. Theater seats occasionally need to be repaired. Pull the damaged seat or back pad out of its metal frame on the theater chair. It may simply pry loose with a screwdriver, or you may have to remove a few screws to facilitate removal. Remove the damaged upholstery from the seat or back pad. If the damage is simply a small tear or puncture, the upholstery can be sewn using a tough thread that matches the seat color. If the damage is more intensive, the upholstery will have to be replaced. Access the damage to the foam. If there are major burns or chunks ripped out of the foam, it will be far easier to simply replace the entire foam cushion than to try and replace it. Glue small tears and holes closed with foam glue. Apply the glue to both sides of the tear and hold it closed for a few minutes. Once the glue can hold the tear closed, set the cushion aside for the glue to fully cure (times vary with different products, but should be listed on the bottle). Reupholster the chair, either with the repaired original upholstery or new fabric. Theater seat upholstery is factory-made and slips right onto the seat. Secure the upholstery to the underside of the seat or backside of the back pad. 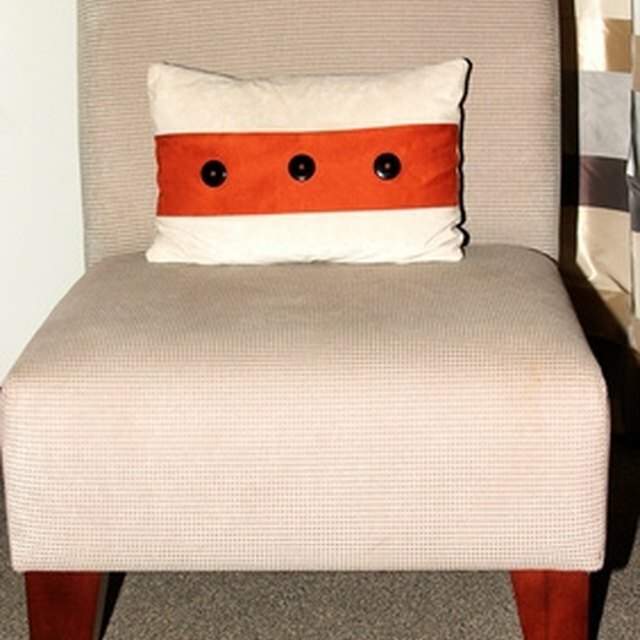 Many seats have inner slots that the excess fabric can be tucked into using a screwdriver. If there is a wood frame, staple the fabric to it. Put the repaired seat back into its metal frame on the theater chair.